Galloping Gems uses a secure shopping cart from PayPal to ensure your information is safe and secure. 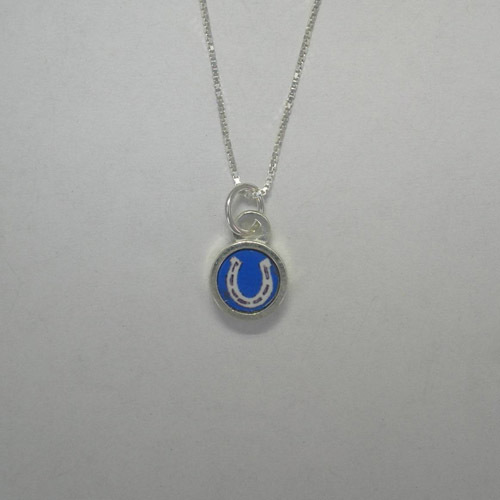 Desc: Sterling Silver reversible mini circle horseshoe necklace. The chain is a box link and has a spring ring clasp. 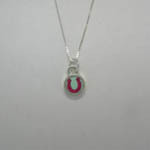 The circular pendant has an acrylic horseshoe, one side is a pastel pink with a blue background. The opposite side is a bright pink horseshoe with a pastel green background. The necklace has a bright polish finish. © 2005 - 2019 Galloping Gems, Inc. All rights reserved. Site designed and hosted by ELF Computer Consultants.